The Global Volcanism Program has no activity reports for Churchill. The Global Volcanism Program has no Weekly Reports available for Churchill. The Global Volcanism Program has no Bulletin Reports available for Churchill. The Bona-Churchill massif in the St. Elias Mountains forms the highest Quaternary volcano in the United States. A 2.7 x 4.2 km wide caldera caps the summit, which is now known to be the source of the White River Ash, produced during two of the largest explosive eruptions in North America during the past 2000 years (McGimsey et al. 1992). The summit of Mount Bona lies 4 km across a high saddle from the younger Churchill. The source vent of the widespread bilobate White River Ash deposit, which blankets more than 340,000 km2 of eastern Alaska and NW Canada, was initially thought to be a pumice mound that is mostly buried beneath the Klutlan Glacier NE of Churchill volcano. More recent work has revealed thick young pumice deposits mineralogically and chemically similar to the White River Ash deposits along the rim of the caldera. Clague J J, Evans S G, Rampton V N, Woodsworth G J, 1995. Improved age estimates for the White River and Bridge River tephras, western Canada. Can J Earth Sci, 32: 1172-1179. Lerbekmo J F, Campbell F A, 1969. Distribution, Composition, and Source of the White River Ash, Yukon Territory.. Can J Earth Sci, 6: 109-116. Lerbekmo J F, Westgate J A, Smith D G W, Denton G H, 1975. New data on the character and history of the White River volcanic eruption, Alaska. In: Suggate R P and Cresswell M M (eds) Quaternary Studies, Wellington: Roy Soc New Zeal, p 203-209. McGimsey R G, Richter D H, DuBois G D, Miller T P, 1992. A postulated new source for the White River Ash, Alaska. U S Geol Surv Bull, 1999: 212-218. Richter D H, Preece S J, McGimsey R G, Westgate J A, 1995. Mount Churchill, Alaska: source of the late Holocene White River Ash. Can J Earth Sci, 32: 741-748. Richter D H, Rosenkrans D S, Steigerwald M J, 1995. Guide to the volcanoes of the western Wrangell Mountains, Alaska--Wrangell-St. Elias National Park and Preserve. U S Geol Surv Bull, 2072: 1-31. Robinson S D, 2001. Extending the Late Holocene White River Ash distribution, northwestern Canada. Arctic, 54: 157-161. There is no Deformation History data available for Churchill. There is no Emissions History data available for Churchill. 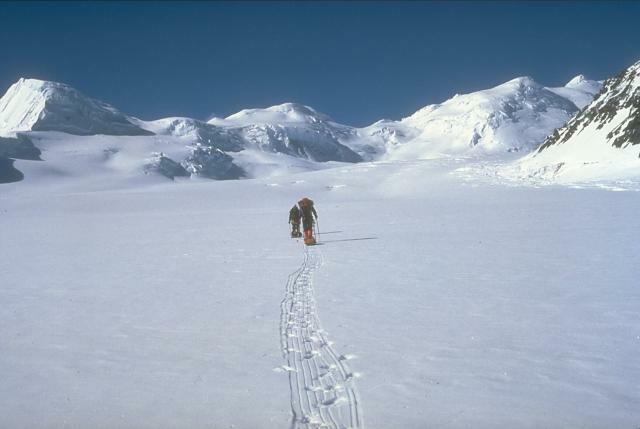 A U.S. Geological Survey climbing party ascends the Klutlan Glacier en route to 4766-m-high Mount Churchill. Their field studies led to the recent discovery that this volcano was the site of two of the most voluminous eruptions in North America in the past 2000 years. The White River Ash, two voluminous ash layers that extend across most of Canada's southern Yukon, originated from the summit caldera of Churchill volcano, which forms a twin volcano with 5005-m-high Mount Bona. The two peaks comprise the highest volcano in the United States. There are no samples for Churchill in the Smithsonian's NMNH Department of Mineral Sciences Rock and Ore collection. Large Eruptions of Churchill Information about large Quaternary eruptions (VEI >= 4) is cataloged in the Large Magnitude Explosive Volcanic Eruptions (LaMEVE) database of the Volcano Global Risk Identification and Analysis Project (VOGRIPA).